AspectPL advanced user training, meet Bob Dedekind, another great AspectPL user tip (re-create jobs) and a humongous chocolate hen! In this edition, we highlight AspectPL usage audit and advanced user training. We meet Bob Dedekind the Technical Manager at AspectPT and we share some tips and tricks on how to re-create jobs in AspectPL. We’ve included an interesting article on manufacturing progress by comparing handmade and factory made products and just for fun find out if a humongous chocolate hen is where Easter eggs come from. In this edition, we talk about making changes in your business in 2019 and we meet Shayne Jones the Business Development Manager at AspectPT. We share some tips and tricks on how to bulk assign classes in AspectPL and include a helpful article on how to stick to your New Year’s Resolutions. Pharmapac’s use of AspectPL, Material Test Bulk Upload tips, Meet AspectPT’s Chris Rauch and go fishing with the kids. In this spring edition, we interview the Pharmapac team and find out how they have mastered AspectPL in their business. We meet Chris Rauch the Software Support Specialist at AspectPT. We share some tips and tricks on how to get the best out AspectPL and include a helpful article on how to get the kids into fishing this summer. With live scheduling, visualisation and an excellent shop-floor process in place, how do you make improvements? How do you get more bang for your buck? Increasingly competitive CPG markets are making consumer-centred innovation—and the successful adoption of digital technologies—essential as the CPG landscape evolves through 2030. 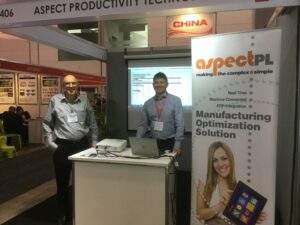 During the second week of May, AspectPT exhibited at NMW 2017 in Melbourne. NMW is Australia’s premier manufacturing exhibition and the only fully-integrated annual event. It showcases the latest products and evolving technologies in the expanding manufacturing market. With over 10,000 attendees visiting during the four days, we happy to have our hands full. We had the pleasure of meeting a wide range of prospects and fellow-exhibitors from a variety of countries. This included the Middle East, China and other parts of Asia, and of course, we caught up with many old faces from Australia and New Zealand. Needless to say, we demonstrated the latest AspectPL software to a significant number of ‘plastics and packaging’ operators, and it was very well-received. Interestingly, there were also a number of enquiries from ‘non-plastics’ sectors, the likes of CNC machinery and engineering businesses looking for advanced production scheduling software and support for monitoring assembly stations and manual work centres. We thoroughly enjoyed our time at NMW 2017, and we’re looking forward to next year’s show.